Illegal mining. 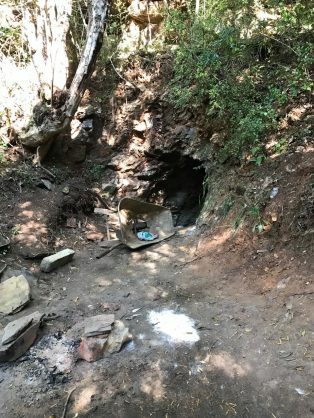 Zama zamas access underground mines illegally in Johannesburg. The city came within 30cm of a major disaster as illegal blasting nearly ruptured a fuel pipeline. He adds that sinkholes have started to appear in parts of Joburg due to tunnel collapses. Illegal miners often chip away at the support pillars left in place by the original miners to hold up the roof. Add underground water and natural earth stresses to the mix, and collapses are inevitable. One of the areas of greatest concern is around the FNB Stadium in Soweto, flanked on either side by gas and fuel pipelines. Four kilometres away, on the west rand, thousands of illegal miners are chipping and blasting dangerously close to Sasol and Transnet pipelines. She adds that Transnet is working closely with the Johannesburg Disaster Management Forum, which is composed of companies, interested stakeholders, emergency services, law enforcement agencies and the Johannesburg Roads Agency (JRA). Other steps include an ongoing public awareness programme with the 24 affected municipalities as well as disaster and emergency services, developers, contractors, landowners and fence-line communities along the pipeline. Sasol’s preventative maintenance efforts include protection against pipeline corrosion as well as a pipeline integrity management system that uses various survey methods, inline inspection and mapping to verify pipeline integrity. Cable theft is another massive threat to Joburg’s infrastructure, and is reckoned to cost the local economy tens of billions of rands each year in replacement costs and disruption. “When power cables are stolen, businesses are unable to transact over a wide area, so it is difficult to quantify the actual cost,” says Mackay. “Cable theft can also put traffic signals out of order, and that causes huge delays to commuters. It is impossible to quantify what is the exact cost of this to the greater Joburg economy, but it is massive. It’s not just Joburg that is affected by this criminality. Last month 22 presumed cable thieves were buried underground at the Gloria Coal Mine in Mpumalanga after cutting overhead cables that powered the giant fans needed to flush deadly methane gas from the working areas. All it took was a spark to ignite the gas and end their lives. We now know that most of the dead were Lesotho nationals from a nearby squatter camp who had been raiding nearby mines to steal cable over a period of years. They arrived in gangs 40-strong and chased security away. If police arrived, they would call for back-up from their colleagues. Mine security, even with the back-up of police, are no match for armed gangs – equipped with acetylene torches and angle grinders – up to 80-strong. Above ground, the thieves destroyed two transformers’ substations worth R50 million to steal metal worth just R500 000. It will take months to get the mine back to normal operation. Mines are rich pickings for cable thieves. Along the M2 in Joburg, the cable thieves work alongside the zama-zamas. At the Cleveland Road off-ramp, scattered among the old mine dumps, you can see the plastic remains of cables stripped for their copper. Their colleagues are working the nearby dumps for a gram or two of gold still secreted within their sandy wastes. The police can do little to stop illegal mining. For one thing, they are not insured to go underground. Then there is the physical danger of coming up against the gangs who control this subterranean world. There are frequent reports of one gang holding another hostage underground and stealing their ore. Killings are a common occurrence. Zama-zamas complain that they are having to pay off the police each time their equipment and ore is confiscated. The police themselves seem to have little interest in arresting people who have no other means of survival. Though these tunnels have long since been abandoned by the original miners, there is still sufficient gold beneath ground to support a thriving underground (literally) economy. By some estimates, 30 000 to 40 000 zama-zamas are hacking away with picks and chisels at old Joburg mine workings, coming back above ground to crush and process the ore. Sometimes they stay below ground for weeks at a time, surviving off a supply line of food, water and batteries from teams above ground. It’s reckoned this supports an eco-sphere of several hundred thousand people in the Joburg area, most of them undocumented immigrants. Illegal mining extends from Springs in the east to Krugersdorp in the west. No-one really knows, but the greater Joburg area is believed to sit atop a rabbit warren of about 160 000km of tunnels, stretching from east to west and depths of up to several kilometres. Government is considering licensing these artisanal miners in the hope that it can re-exert some form of control. At the very least, it would decriminalise an activity that represents a very real cost to the Joburg economy in terms of theft, damage to infrastructure and disruptions.